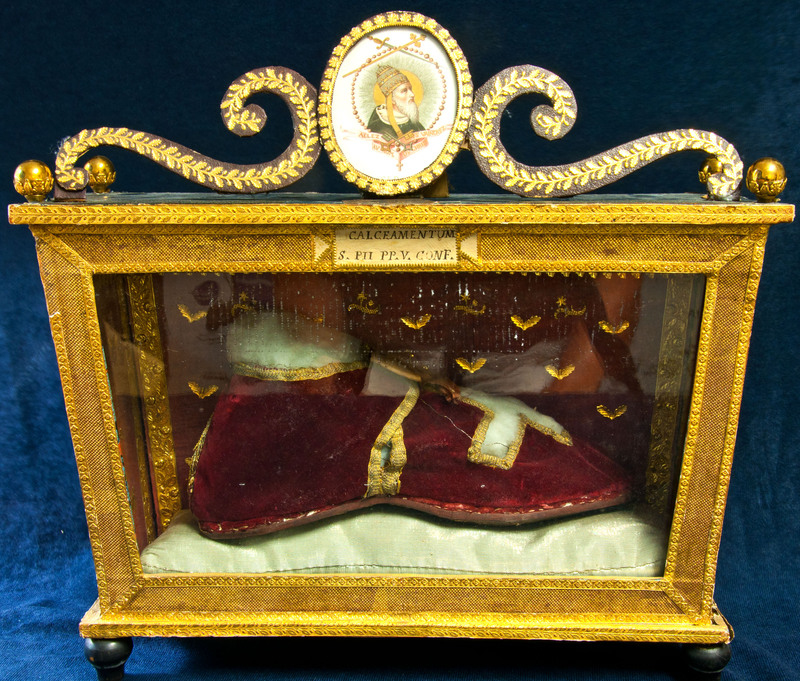 This is a papal shoe belonging to and worn by Saint Pius V. The 2nd class relic is contained in an ornate case with the Pope’s photo atop and an inscription, in Latin, Calceamentum S. PII PP. V. CONF. The inscription indicates this is a shoe (Calceamentum) belonging to Pope Saint Pius V. Because of his canonization, it is a 2nd class relic. The Collection has another pair of shoes belonging to St. Pius V. They are white leather. This particular one appears to be an indoor shoe, a slipper because of its softer, velvet fabric. A white cross adorns the front of the shoe and a gold braid tie. 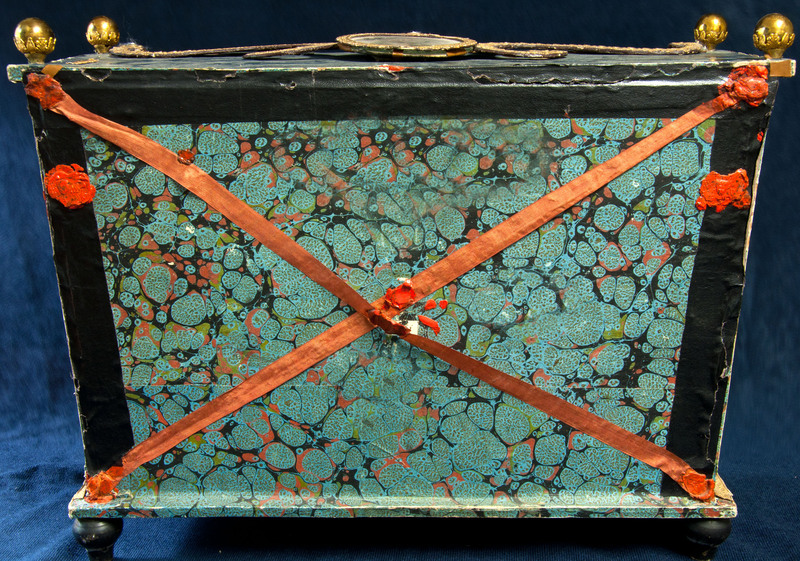 The back of the case is featured here to show the unbroken wax seal indicating its authenticity. Before 1969, the pope wore episcopal sandals during the Mass and the color of the sandals matched the various liturgical colors of the vestments. Outdoor shoes were made of plain red Morocco leather and also had a wide cross in gold braid. Various modern popes added and eliminated decorations on their shoes according to their own personal tastes. Popes also have their own personal cobblers in Rome. 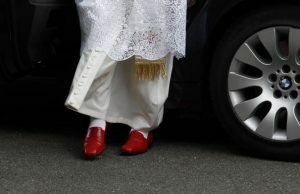 The red shoes are one of the few remnants, along with the camauro, papal mozzetta and tabarro that are of the former red color of papal garments. Pope Francis has dispensed with red shoes! Romans knew that the timetable for the papal conclave would be a quick one when the three sets of vestments prepared for the new pontiff—in small, medium, and large sizes—had already disappeared from the display window of Gammarelli, the ecclesiastical tailors, on Friday, March 8. The three white wool satin cassocks had appeared on March 4, along with one scarlet capelet, the mozzetta, trimmed in white ermine, versatile enough for one size to fit any aspiring pontiff, a single pair of red kangaroo-leather shoes in a medium size and a white moiré silk zucchetto, the pontifical skullcap. Though they are loaded with Christian significance, many of these articles of clothing actually have a far more ancient pedigree. Those red shoes, for example—which Pope Francis has now given up in favor of a more ordinary brown pair from Mexico—may symbolize the blood of Christian martyrs. But when red shoes were the height of fashion in Etruscan Rome, that is, five hundred years before the birth of Jesus, they designated the wearer as an aristocrat, someone who could afford leather that had been colored with the most expensive dye in the Mediterranean, Phoenician “purple”—which was actually scarlet red. (It was produced by scoring the bodies of molluscs and ranged in color from blue to red, with red the most prized shade.) The leather itself came not from kangaroos, of course, but from the Chianina cattle, who came to Italy together with the Etruscans and provided the ancestral form of Florentine beefsteak. Pope Benedict XVI in London, 2010–an example of modern papal red shoes.